What is Kasuri Silk Mohair? Kasuri, in japanese, is the word for IKAT - which is fabric that has been woven from fibers to create patterns on the finished piece. These beautiful, handpainted silk and mohair yarns create lovely, subtle blended fabrics when knitted or crocheted. Hand-dyed silk and mohair is soft and lustrous. 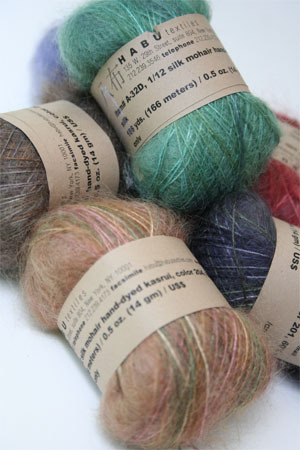 Beautiful as a weft yarn for weavers, and so light and delightful for knittersand crocheters. It will take only 1-2 balls to make a good size scarf. Packaged in little, delightful japanese style bundles.